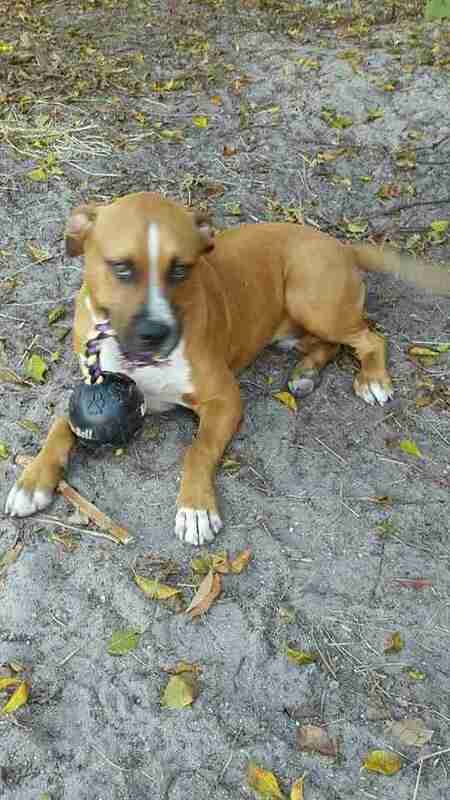 Weeks after being rescued from an illegal slaughterhouse operation, perhaps best described as hell on earth, this sweet young pit bull is finally learning what it means to be loved - and he has a new toy to prove it. 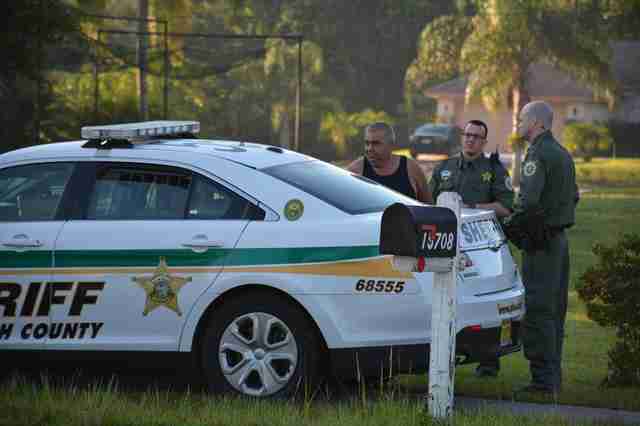 Kona was among hundreds of animals seized in October during raids on illegal farm slaughterhouses in Palm Beach, Florida, described as the largest tactical strike on extreme animal cruelty operations in U.S. history. For months prior, investigators from Animal Recovery Mission (ARM) had been working undercover to document abuses at the farms, one of which was called Rancho Garcia. That's where they first met Kona. "He was going to be prepped for fighting," ARM founder Richard Couto told The Dodo. "While we were undercover, all the ARM investigators really took a strong liking to him. He's a really lovable, amazing, amazing dog. We were hoping to strike the property soon enough, while he was still alive." Couto had real reason to be concerned. The farm's operators had been observed brutalizing a variety of animals in the most unimaginable ways, and their dogs weren't spared from this torture either. Fortunately, ARM and local law enforcement interceded in time. 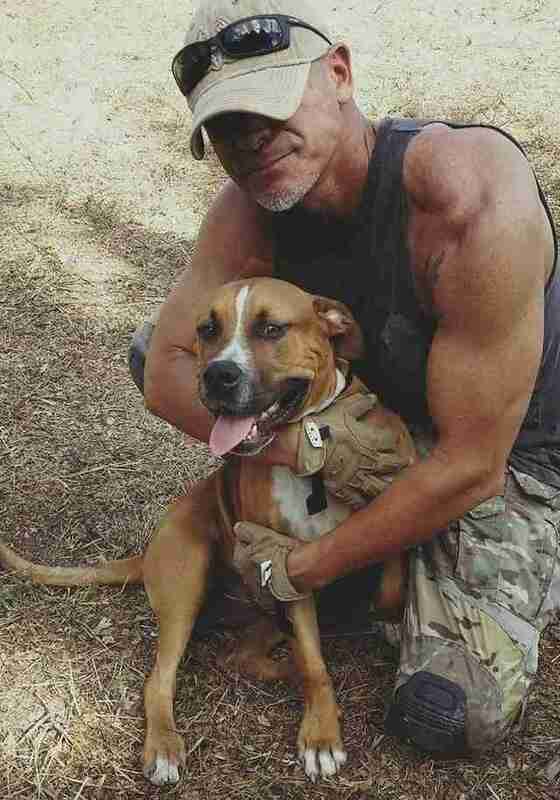 "We'd been undercover, so couldn't show any affection to the animals, so it was the first time I could get on my knees and be nice to them," Couto said. "Kona was the first animal I came in contact with, and he jumped in my lap and started licking me. It was a great feeling." Following the raid, during which her owner had been arrested, the dog and nearly a thousand other animals were brought to safety. After spending several weeks under the care of animal control, the paperwork came through allowing Kona to be taken home by a new family. Couto jumped at the opportunity. "I rushed to animal control and personally adopted him," he said. 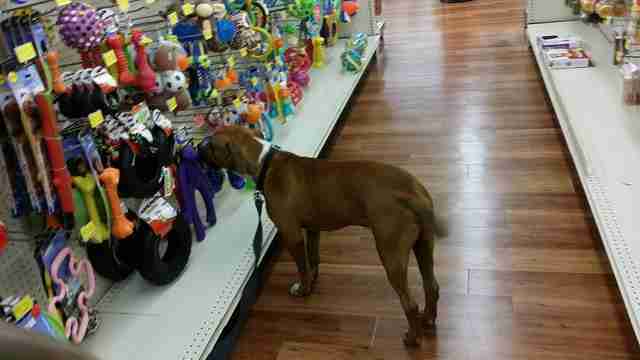 One of the first orders of business to mark the formerly-abused pup's transition into a happy life was to pick out a toy. "I took him to a pet store for the first time," Couto said. 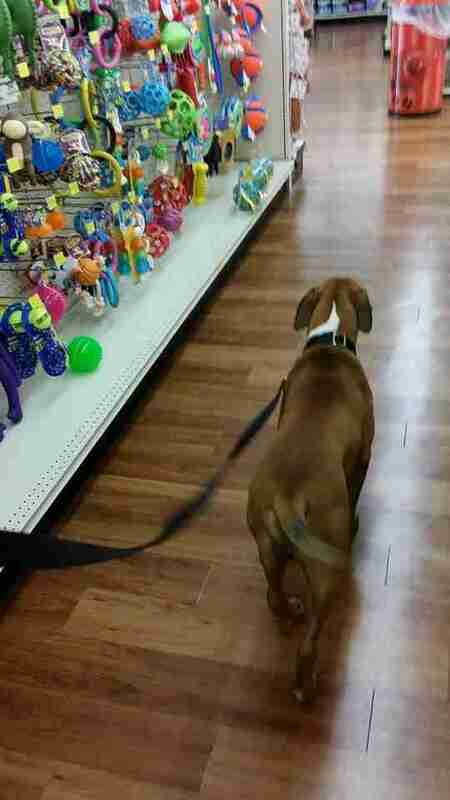 "I let him walk through the aisles. It was very foreign to him. He's never owned a toy. He's never owned a bone, unless it was from a slaughtered animal. He used to have to fight for the scraps of horse meat. The first time he'd ever owned a toy. It was a nice moment." With a little love, the dog who had spent his whole life living in terror has become unrecognizable. "He's probably the most lovable dog that I've ever had. He won't even bark," said Couto. "There's not a vicious bone in his body. On the farm, he was scared. You could see the fear on his face. Now he's literally a new dog. He's at our sanctuary, surrounded by people who love him." Kona, who's only about a year old, will be able to live out his days in peace and comfort along with hundreds of other animals - including cats, cattle, sheep, goats, rams, ducks, swans, pigeons, rabbits and horses - each of whom were rescued during the recent raids. "They're all at our sanctuary now," said Couto. "The animals that we have are ours for life. They'll stay with us forever." That gentle dog is even doing his part to keep them safe. 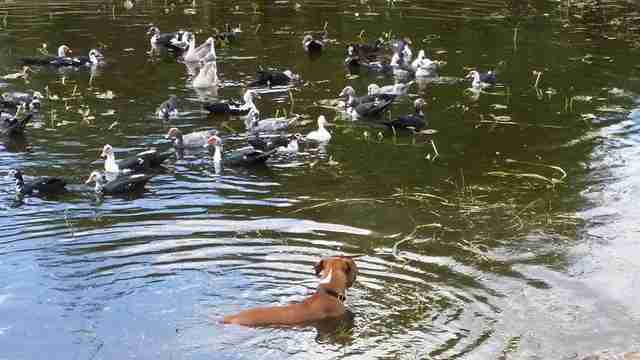 "[Here is] Kona protecting the ducks and swans rescued from same property," Couto said. "He thinks they're his flock." 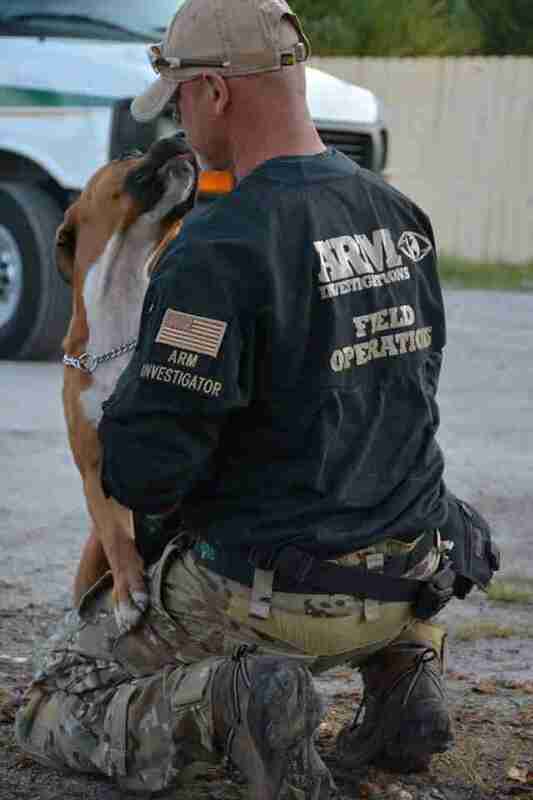 To learn how you can help Animal Recovery Mission's efforts, visit their website here.